The selling of Treasuries by China has been the primary culprit in the spike in interest rates in recent months and is likely quickly approaching its nadir. As I will discuss in a moment with respect to the trade deficit, there is little evidence of a sustainable rise in inflationary pressures. The current push has come from a temporary restocking cycle following a very weak first half of the year economically speaking, and pressures from higher oil, health care and rental prices. But what kind of crisis might that be? Well, considering the plunge in the Yuan and the pressures on China, you might want to pay attention to the Shanghai index. I mentioned above that I wanted to discuss the trade deficit and the expectations of rising inflationary pressures. While there are indeed EXPECTATIONS that inflation will be a problem in the future, there is currently no evidence supporting those expectations currently. While there has been a small bump in prices of imports and exports, which coincides with the bump in oil/energy prices, the trend of pricing power is still sorely negative. Importantly, declines in import/export prices to such a degree have been indicative of recessions in the past. With the dollar rising, which puts pressure on exports, the recent bounce in pricing power is likely temporary and will push toward lower levels putting downward pressure on corporate earnings and economic growth. 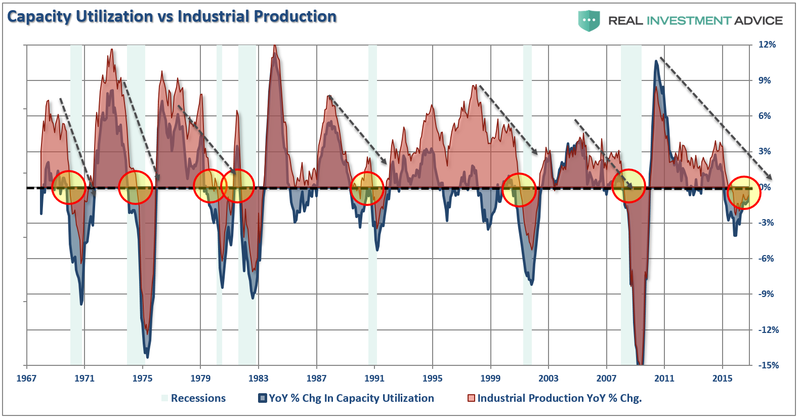 It is not just import/export prices that are trending weaker but we are seeing the same weakness prevail in industrial production and capacity utilization. While year-over-year rates have improved recently, following an extremely weak 4th-quarter last year, the negative trend in production and utilization suggests little about a resurgence of economic activity which would foster a demand-push inflationary rise. Just from an anecdotal view, declines of this magnitude and duration have previously been more coincident with the onset of a recession than not. Inflation can be both good and bad. Inflationary pressures can be representative of expanding economic strength if it is reflected in the stronger pricing of both imports and exports. Such increases in prices would suggest stronger consumptive demand, which is 2/3rds of economic growth, and increases in wages allowing for absorption of higher prices. That would be the good, but unfortunately it is not the case. The dichotomy of between expectations of inflation and its ultimate reality will likely soon be recognized. Rate Hike A Vote Of Confidence? Really? Really? The rate hike was a vote of confidence in the economy? This is irony considering the direction of growth since 2011 has been consistently BELOW expectations set by the Fed as shown by the median of their own forecasts versus reality. She is right, it does. This according to the Fed’s own Labor Market Conditions Index. Historically speaking, peaks in the 12-month average of the LMCI index have been coincident with declines in employment and the onset of weaker economic growth. As shown in all the data above and the EOCI index below (a broad composite of manufacturing, service and leading indicators), the current economic bounce is likely another in a series of temporary restocking cycles. These cycles have been repeatedly witnessed after cyclical slowdowns in economic growth. Furthermore, as shown below, with the broader economy operating at levels more normally associated with recessions than expansions, there is little suggesting an ability to support substantially higher rates or generate inflationary pressures above 2%. Which is why interest rates on the 10-year treasury have likely seen their peak currently and will be lower in 2017 as overly exuberant expectations are dragged lower by economic realities.